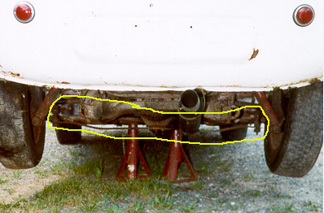 The original swing-axle independent rear suspension of the Triumph Herald and Spitfire had its limitations. Setting of "static camber" was critical. There was a tendency of the rear wheels to tuck under during certain cornering conditions, such as quick transitions. 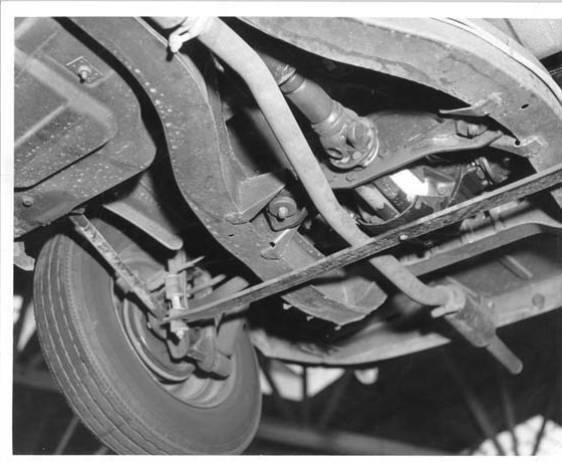 This was due largely to the inherent limitations of a swing-axle suspension as well as the high effective roll center created by a solidly mounted transverse leaf spring atop the differential. Standard-Triumph USA's Competition Manager "Kas" Kastner developed a beautifully simple solution to the problem: the camber compensator. 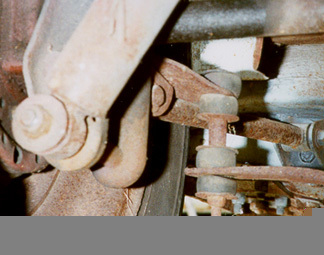 This single leaf spring, bolted to each axle's vertical link at the radius arm mount and fastened by a single bolt to a mount on the bottom of the differential, was an easy, bolt-on modification that greatly reduced the tendency of the rear wheels to tuck under. De-arching and stiffening the "main" transverse rear spring was also a common and recommended modification, one used much by Triumph itself on the "Works" Spitfires, by Sir Jack Brabham on his Coventry-Climax-engined Heralds and by many other tuners and owners of Heralds, Spitfires and GT6's. For the 1971 Spitfire Mk.IV, Triumph redesigned that transverse swing and mount so that all but the main leaf would rock or "swing" rather than being solidly clamped to the top of the differential. This lowered the effective roll center and greatly reduced not only the roll stiffness in the rear but also the amount of camber change during cornering. * This reduced roll stiffness, and the potential of increased oversteer that would result otherwise, was tamed by increasing the diameter of the front anti-sway bar. 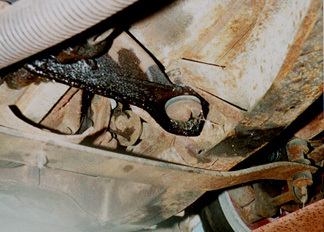 The updated rear spring and front sway bar can be bolted onto earlier Spitifres. However, the camber compensator remains a simple and effective means of "taming" the rear suspension of a Herald, Vitesse/Sports 6 or Vitesse 2L, pre-Mk.IV Spitfire or "Mk.1" GT6. *I have seen figures quoted for the total camber change of a given rear wheel of as much as 21 degrees for the original suspension, and about 7 degrees for the swing-spring suspension. Click here to see how a friend of mine is reproducing camber compensators, long unavailable new. "Top" view of the two different styles of the LHS bracket. Although the "fatter" one also appears shorter, that is mostly an optical illusion due to the angle at which the photograph was taken. But the difference in the size of the hole for the bolt/bushing is no illusion; it is larger on the link to the right of the picture. Another view of the two styles of brackets, from the opposite side. 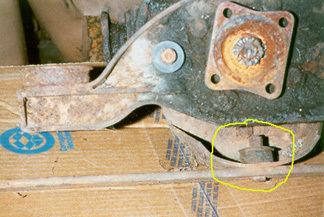 This shows how the leaf spring is bolted to the center mount on the differential. The rubber bushing is inside (above) the mount, while the spring is below, free to pivot on the mount. 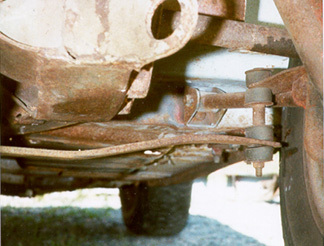 Above left: From the rear of the car, a view of the left hand side link from the spring to the mount, installed "straddling" the existing radius arm bracket on the vertical link. Above right: As with the previous shot, but showing the right hand side. Another view of the installation from below and slightly forward of the differential. Underside view of an early prototype camber compensator. Compare with preceding photo, particularly the shape of the spring leaf. Photo courtesy Kas Kastner; used with permission. Why not list your Spitfire with The International Triumph Spitfire Database? And, of course, check out The Vintage Triumph Register. Or return to my home page.